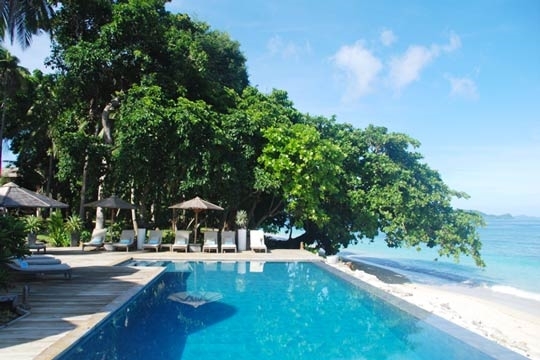 Live out your rock-star fantasies at Ariara, a private island with a luxurious eight-bedroom villa staffed by more than two dozen people eager to give you the holiday of a lifetime. Just getting to Ariara is part of the adventure. 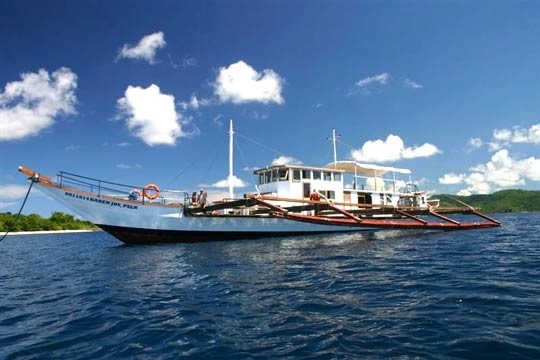 After flying to Busuanga Island, one hour south west of Manila, you're taken across a lush landscape of undulating hills to Coron harbour where the 30m Karen Joy, a trimaran yacht converted from a local fishing boat, awaits. 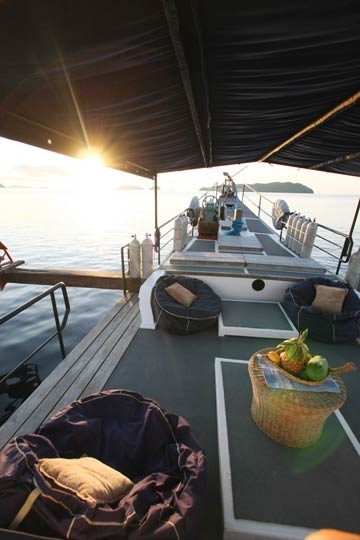 Enjoy a leisurely four-hour cruise on the Karen Joy's spacious decks, or snooze away your jet lag in one of its five air-conditioned cabins. Those wishing to zip to the island more quickly may hop onto the speedboat in tow at any point along the journey. 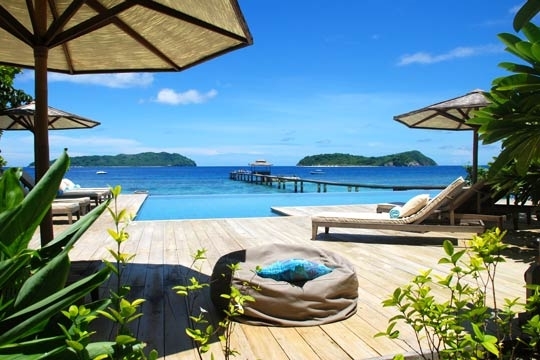 Those with less time (and more money) to spare may be whisked away to Ariara by helicopter from Busuanga airport, or, in true celebrity style, direct from Manila. On arrival, you're met with the breathtaking scene of Ariara Island with its thatch-roofed villa pavilions nestled between a 500m-high fertile hill and the 600m sparkling white beach, surrounded by crystal clear, turquoise waters. 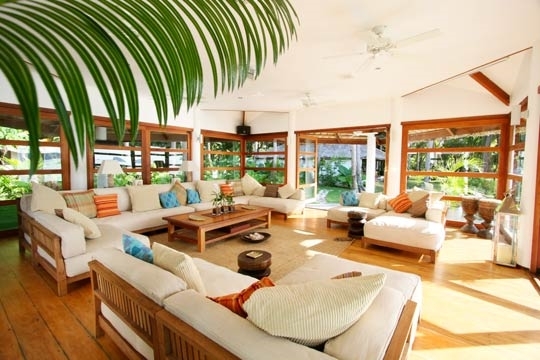 The villa features a beautifully constructed two-level central pavilion for dining and lounging, with one spacious bedroom upstairs, while strung along the beachfront are seven bedroom pavilions, each with a king-sized bed, entertainment system and fabulous ensuite bathroom. If you're seeking a leisurely pace of life, then sit back and enjoy fresh and creative cuisine served by the friendly staff, sunset cocktails on the pier, and lazy afternoons by the 12m infinity pool. 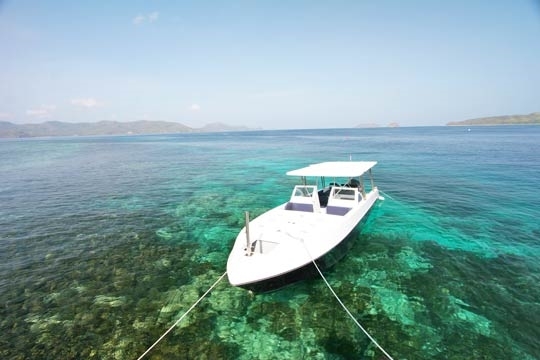 Those with a taste for adventure have two speedboats, two jet-skis, three kayaks and a wide selection of water-sports equipment at their disposal, not to mention a protected reef teeming with marine life to explore with the villa's own PADI dive master. Within easy reach by boat are several fascinating sights including fisherman's villages and more spectacular dive spots. Like the Choose Your Own Adventure children's books, a holiday at Ariara is tailor-made to your needs and desires. Design your own itinerary and gourmet menu selections with the Ariara team (all food is included, alcoholic drinks extra), or let them guide you with their inspired ideas on what to see, do and taste. At Ariara, the possibilities are limitless, the choices many, the experience ... unforgettable. An exciting new frontier for luxury travel. The magical Ariara Island is truly an exciting new frontier for luxury travel. It might sound clichéd, but Ariara really does have it all: an incredibly pristine hideaway location, superb craftsmanship, inventive design, fabulous cuisine and a team that is absolutely thrilled to serve and guide you every step of the way. Since we tend to be lulled into laziness in the tropics we were quite content, really, to simply curl up on a poolside sun lounger with a cold San Miguel brew in hand, but our hosts had other plans for us! In just one day we were given dive instruction by the PADI-certified dive master, then plunged into the sea just metres offshore at a colourful site full of exotic marine life. Later, we hiked up the island's inland trail to the hilltop and were treated to an amazing panoramic view. Then, after returning to the villa and cooling off, it was time to climb aboard the Karen Joy for an excursion to a nearby fishing village. Still, we made it back to Ariara in time for a sunset cocktail and a three-course dinner featuring fresh lapu lapu (red grouper). There's no need to do all this in one day, of course. One could easily spend weeks, even months here and have a new adventure each day – or simply do nothing but lie back and contemplate the changing colours of the jewel-toned sea. And the food, oh the food! Among the rich and varied things we sampled were wonderful, exotic fruits – some picked off wild trees on the island, giant lobster, imported beef steak barbecued to absolute perfection, pastas and salads made with organic cheeses, herbs and vegetables, fabulous desserts including orange and basil sorbet and the local rice and coconut bico treat. Being a remote island, getting fresh food in (aside from seafood, which fishermen bring directly to shore daily) is a big undertaking, and coordinating it all is a chef on the island and a Swiss chef based in Manila who operates her own organic dairy farm and expertly sources the finest imported foods and wines. Ariara was six years in the making by a very resourceful, creative and passionate team. With its potent combination of ground-breaking standards of service and a wild, largely undiscovered marine wonderland, we believe that it won't be long before Ariara is the place that others in the super-villa business will be scrambling to imitate. 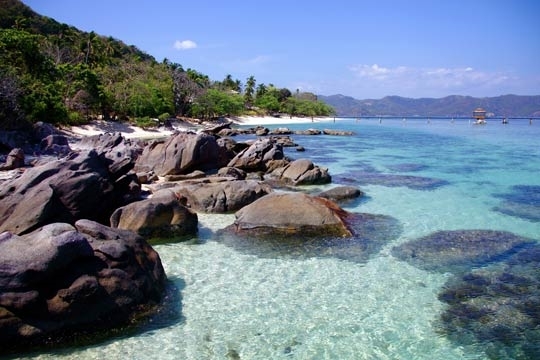 You have an entire island playground, including its pristine jungle, beaches and reefs to explore. Need we say more? 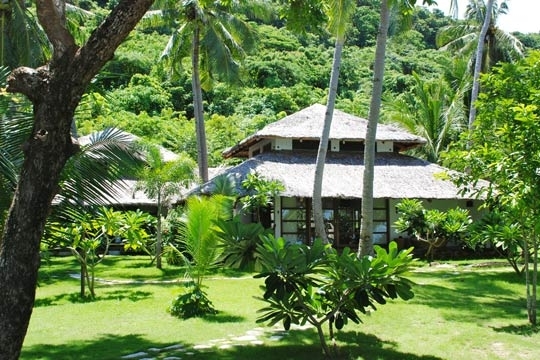 The large and enthusiastic villa team on hand to serve you, including your own personal PADI dive master, and the wide range of facilities/equipment are other big highlights. The pool is open and the pier has no barriers or hand rails, so guests with young children will need to be watchful in these areas. Also, those wishing to indulge in some sunset cocktails on the pier's gazebo must be mindful of the walk back to shore! Open pool - watch the kids! Ariara is a private island paradise, 50 hectares in all, including 600m of pristine white-sand beach, jungle paths and protected reefs extending more than 200m around its perimeter. The sea is crystal clear and teeming with marine life and colourful coral outcrops, offering ideal diving and snorkelling conditions. 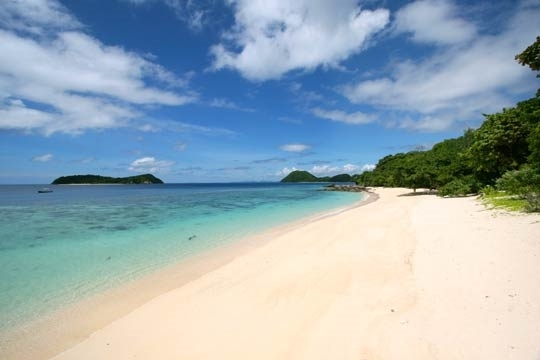 Two nearby islands, also under Ariara ownership and reached within minutes by speedboat, each feature sparkling white sands, clear waters and reefs. 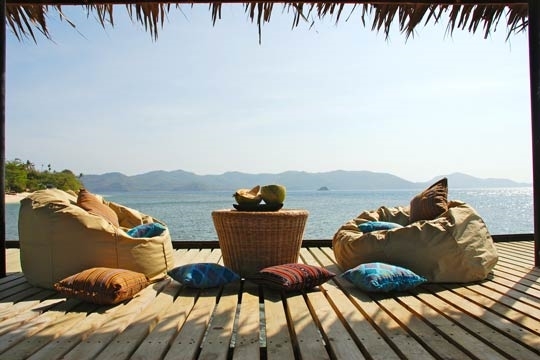 The idyllic Calamian islands sit at the northern tip of Palawan Province in the Philippines. Only an hour's flight, yet a world away from Manila, these islands have a fascinating history and, sitting at the convergence of the Sulu and South China seas, host an incredible abundance of marine life. The main island, Busuanga, has a small domestic airline terminal. Across the island on its southern tip is the town of Coron, with a colourful harbour where fishing and tour boats are moored. Aside from the large central market featuring the freshest seafood selections and a sprinkling of shops, guesthouses and restaurants, there is little to see in this tranquil town nestled at the base of lush green hills. Boat tours around the islands are a popular pastime. The nearby Calauit Island is home to an odd sight: sharing the island with native Palawan creatures are a number of African species including giraffes, zebras, impalas and gazelles running free through its lowland forests. Said to be a leftover pet project from the indulgent Ferdinand Marcos era, it is now a protected wildlife reserve run by the government. 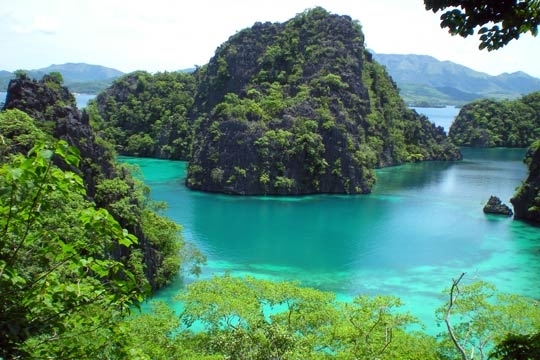 Coron Island features a clear and pristine inland lake, while other islands dotting the area have splendid white sand beaches and lush jungles with streams and hot springs. The province of Palawan is an archipelago situated along the Western border of the Philippines, 30 nautical miles South of Mindoro and 60 nautical miles North of Borneo, bounded on the East by the Sulu Sea. Known for its world-class dive sites (including several sunken WWII Japanese ships), lush rainforests, thermal lakes and misty mountain landscapes, Palawan has some of Asia’s most breathtaking and best-protected natural treasures. Among the fascinating areas to explore in this largely untouched region is the Subterranean River National Park in Puerto Princesa, a mystical landscape with towering karsts and an eight-kilometre underground river – recently declared to be one of the New Seven Wonders of the World. The Tubbataha Reef National Marine Park is another natural jewel with a rich diversity of birds and marine life thriving in a dramatic Pacific-isle setting that includes lagoons, extinct submerged volcanoes and coral islands. Palawan has four domestic airports, each of which is about an hour's flight from the Philippines' capital, Metro Manila. 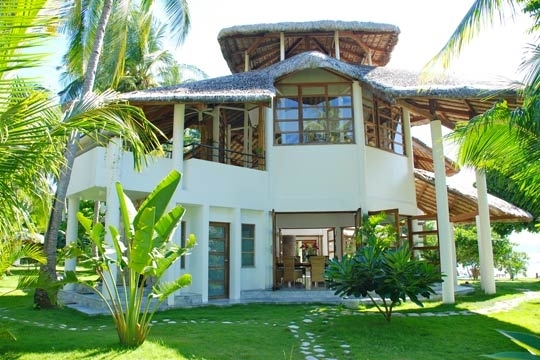 Villa Ariara is a collection of thatch-roof luxury pavilions strung out along the beachfront, with every room offering sea views and beach access across a narrow strip of tropical gardens. 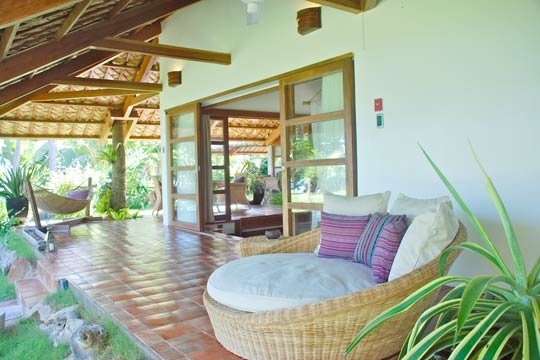 Designed by celebrated Filipino architect Jorge Yulo, the villa blends rustic local flair with modern sensibilities. 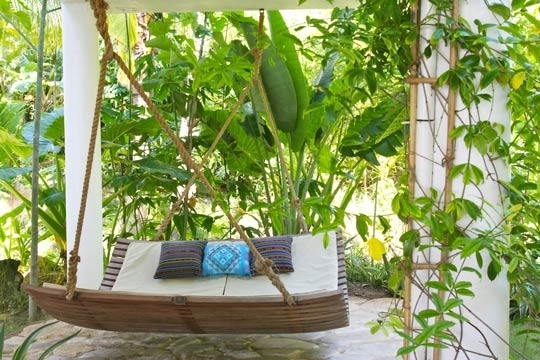 Inside are wall hangings and decor items made by skilled potter and artist Ugu Bigyan, and most of the wooden and rattan furniture and finishings – from the hammocks to the bed frames – were designed and built by Ariara's own craftsmen right on the island. 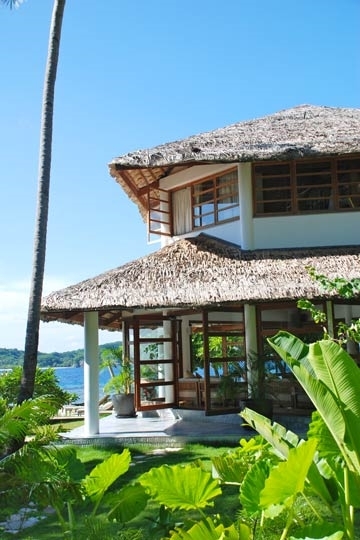 At the heart of the villa are its dining and living rooms, set in two pavilions connected by an open atrium featuring a gigantic traditional wooden drum from Mindanao. 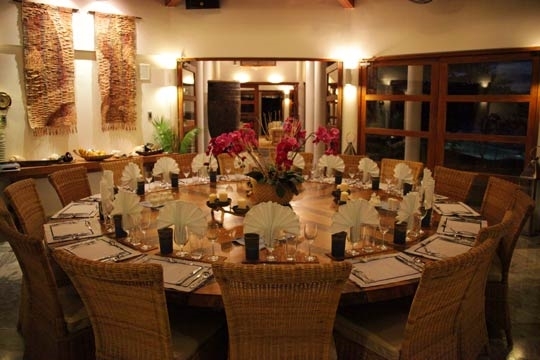 Meals are taken in elaborate style around a massive round stone and wood table seating 20. With an elegant grey marble floor and an incredibly complex, gorgeous palm-frond vaulted roof overhead, this is truly a dining area fit for royalty. The adjacent living room is the perfect place for a party, complete with a soft tan sofa set and a top-notch entertainment system including a projector screen. Upstairs, the king-bedded 'Pier Suite' with ensuite shower room, provides the best sea views and a shaded lounging area. Four more bedrooms are set in one-storey 'Beach Villas' with wraparound verandas, king-sized four-poster beds, walk-in wardrobes and generous bathrooms with outdoor showers and freestanding bathtubs, two in luxuriant wood and two in striking solid grey marble. 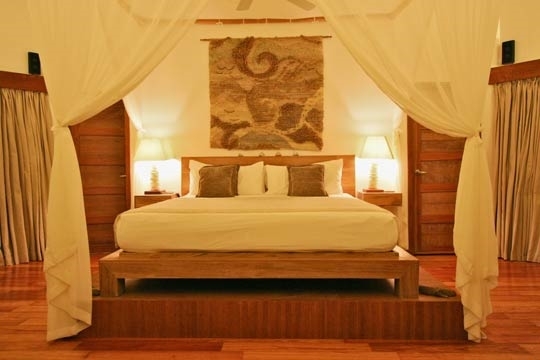 Two other bedrooms are set in stilted 'Jungle Villas', with a ground-floor patio directly under their king-bedded suites. 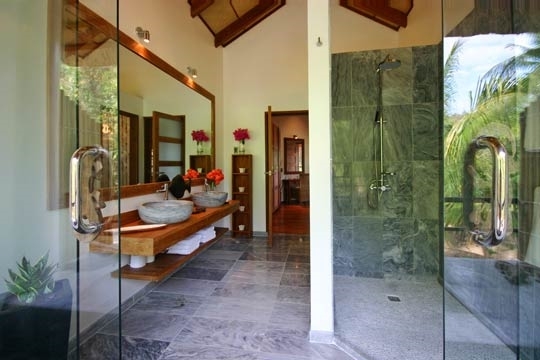 In their spacious bathrooms are outdoor marble bathtubs with views of the jungle-clad hill. Connected dressing rooms have daybeds where a young child could sleep. 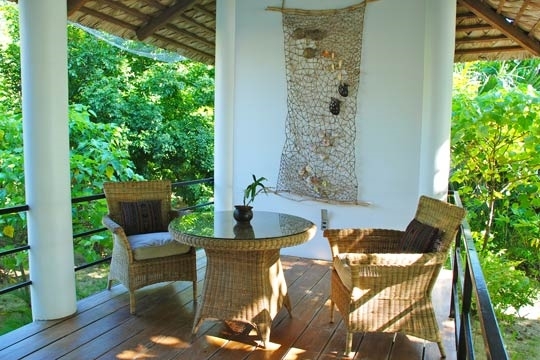 One Jungle Villa has an annex suite with a single bed and small ensuite bathroom, also ideal for a child, while the same space in the other Jungle Villa is open and furnished with a rattan dining table set. 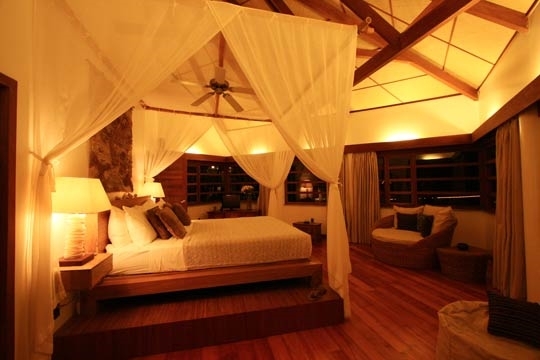 North Beach Villa, the eighth and largest bedroom, is in a single-storey pavilion across a small wooden bridge near the end of the beach, with a king-sized bed and ensuite bathroom. On request, this can be converted into a dorm-style room for children or a recreation/fitness room. There's a commercial-sized kitchen building behind the main pavilions, but you're unlikely to ever step foot in it! Note: Above prices are subject to change. The villa will confirm the rates at the time of booking. For approximate rates, please click on the Check Availability button and enter your dates. Upon arrival at the villa you will be required a security deposit via credit card which will allow for damages and any additional charges that you may incur to be charged against the card. 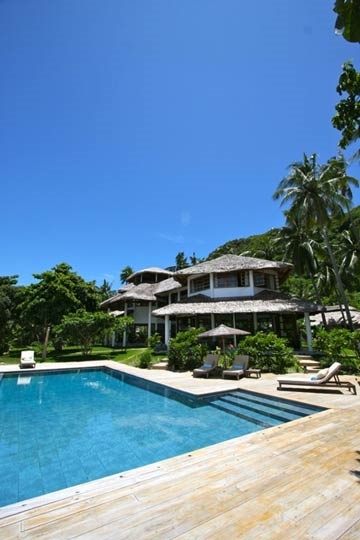 8 bedroom villa located in Calamian Islands, Palawan. Ideal for Beachfront, Body and soul, Bring the relatives, Eco aware, Executive escape, Kid friendly, Gastronomic delights, Fair share for groups, Private island hideaway, The great outdoors, Party pads, Room with a view, Perfect for weddings.